Laura signed a recorddeal with Gold Typhoon, China's largest recordcompany. The first CD was recorded this summer, partly in Holland and in Beijing, and was recently presented to the press and the public. The CD is titled "Flower" and contains 10 tracks of which 4 are sung in Chinese! The songs are all Chinese originals but Laura arranged them in her own way giving them that typical 'Fygi- sound'. A surprising combination! For now the cd is only available in Asia but we can give you information where or how to obtain it, or any of the other cd's if you use the orderbutton on the home page. During an exclusive lunch in Shanghai last week Laura met Michael Bolton. They got along really well. Laura's hands immortalized for the Hall of Fame at the Galaxy Hotel Macau. On November 14 Laura was asked to perform at the Galactic Lunch that was organised bij the ISTA for a very exclusive party. 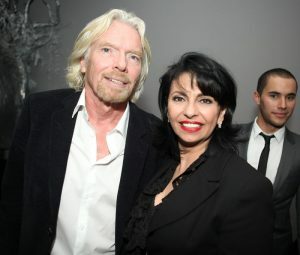 Among the guests was none other than Sir Richard Branson. 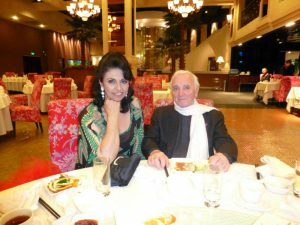 In Hong Kong Laura experienced a very special moment when backstage at the Cultural Centre a remarkable reunion took place that she had caused... The song Rose, Rose I Love You, that Laura recorded in Chinese and that was added as a special bonus for the Asian market on her latest album The Best Is Yet To Come, was composed by the father of Prof. Chen Gang (left in the picture and 79 years old!). 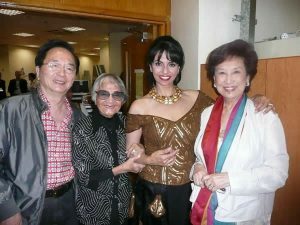 It was first sung by Ms Yao Lee (91) and made a hit by Ms Rebecca Pan (80) in the early 50's. Previously Laura made a tribute to this wonderful trio before she sang her version of this classic song to the enthusiastic audience. Last week the photo shoot for the cover of Lauras new album took place which is due for release early next year and is titled The Best Is Yet To Come. 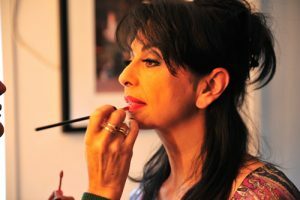 Photographer Patricia Steur made sure Laura looks fantastic! These pictures were taken by Marcel Pelgrim who made a report for www.yourwayoflife.nl , the Online Glossy.